After a cherished heirloom breaks, a grandfather and granddaughter must accept the deeper loss that binds them in order to restore music to their lives. I made Beeswax because for my first fiction film I wanted to draw from stories personal to me. In this case, they were childhood experiences with my own father and grandfather. The timing of the writing of the script corresponded with my father’s retirement and so I also saw an opportunity to merge my passion for visual arts with my Dad’s lifelong passion for music, now unleashed in his free time. I grew up seeing a lot of Italian American family stories in cinema, but none of them felt quite like my own flavor of upbringing, so I needed to get that out of my system. My childhood was my grandfather burying a fig tree underground to insulate it until spring from the harsh Boston winters. It was my grandfather turning the lathe and fashioning chess pieces. It was my father’s daily commitment to music and accordion. And yes, it was a lot of epic cooking from my mother and grandmother. But it wasn’t just that. And that is something I wanted to stress — an Italian American experience less about what you might be accustomed to seeing on the screen — less mean streets and more backyard chickens. Location availability constraints led Beeswax to begin shooting on the 7-year anniversary of Tony Magliozzi’s death. Tony Magliozzi, Director Cristoforo Magliozzi’s grandfather, was the inspiration for the character of Pops. And because Cristoforo’s father, David Magliozzi, flew in from Boston to cameo and play accordion for the Austin production, they spent the day reflecting on the loss of a shared loved one — in parallel to the film’s story being shot. 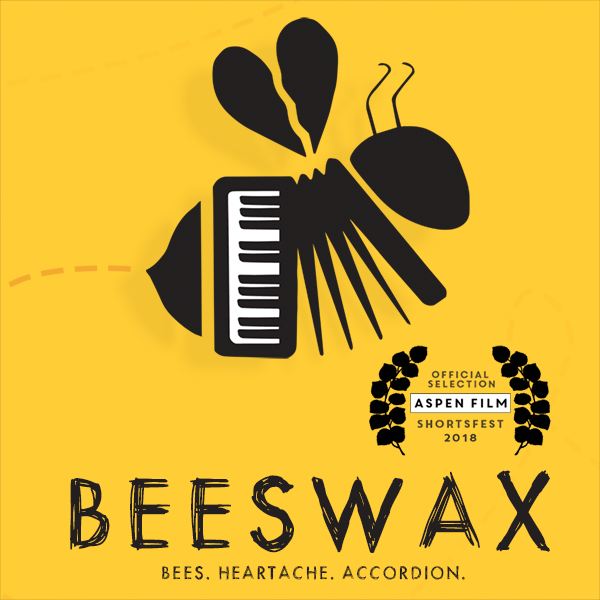 While the pictured accordion in the film is Director Cristoforo Magliozzi’s own accordion, the reed block and reeds come from an accordion donated to the film by Austin accordion repairman Chad Walker. The donated accordion had tragically been destroyed in a fire and its owner had passed away. Walker requested that when done with the accordion that it be burned and recorded in slow-motion in memorial to its original owner. Beeswax composer David Magliozzi is writing a musical tribute to be paired with this additional footage. Committed to authenticity, the pot boiling on the stove was an actual reed wax mixture combining olive oil with beeswax and propolis (bee glue) acquired from Bee Friendly Honey Farm where part of the film was shot. This proved to be a sticky situation in the following scene because the mixture worked! The reeds were setting and hardening into the reed block quicker than the scene could be reset for another take. Director Cristoforo Magliozzi traveled with his father and music composer David Magliozzi from Boston to New Jersey in the winter of 2016 to meet with Guenadiy Lazarov, a family friend and expert accordion repairman (profiled by the New York Times in January 2018). The trip sought the tuning and repair of Cristoforo’s own accordion, which was ultimately pictured in the film. Cris shot some footage for research during the visit, which ultimately became the content in the flash cuts that appear after the reed block breaks in the movie. Part of the process behind Beeswax included hands-on lessons in beekeeping for the Beeswax cast & crew. Learning from Bee Friendly Austin honey farmer, Tanya Phillips, a solution to how to shoot Anna getting stung arose. Drone (male) bees do not have stingers and a jar of these critters was wrangled for the shoot with a dab of honey on child actress Lucky Cantu’s hand to coax them to stay in place. By a few takes in, Lucky had given nicknames to the various stunt bees and was re-positioning them herself when they fell off. Both Lucky and actor Tom Swift worked hands-on with a live beehive (and suitable protection). The off-camera crew, all shrouded in bee suits, looked like a circle of astronauts. (Additional still images available). Drawing from his background in various modes of design, Director Cristoforo Magliozzi designed the film’s logo as part of the conceptualization for the film. The logo combines a bee, an accordion, and a broken heart (the wings). Beeswax was shot entirely in Austin, TX at Boggy Creek Farm and Bee Friendly Honey Farm. Special thanks to The Russo Brothers Italian American Forum, The National Italian American Foundation, Italian Sons and Daughters of America, and Anthony and Joe Russo. For a private screener link, please contact Cristoforo at Cristoforo@utexas.edu. Hey Buddy!, I found this information for you: "Beeswax". Here is the website link: http://devsite.cristoforomagliozzi.com/video/beeswax/. Thank you.